Red Velvet Cake is arguably one of the most well known cake flavors. But this old fashioned southern favorite has definitely evolved over the years. And now you can bake a variety of Velvet Cakes or Cupcakes, including Green, Pink, Blue and more. 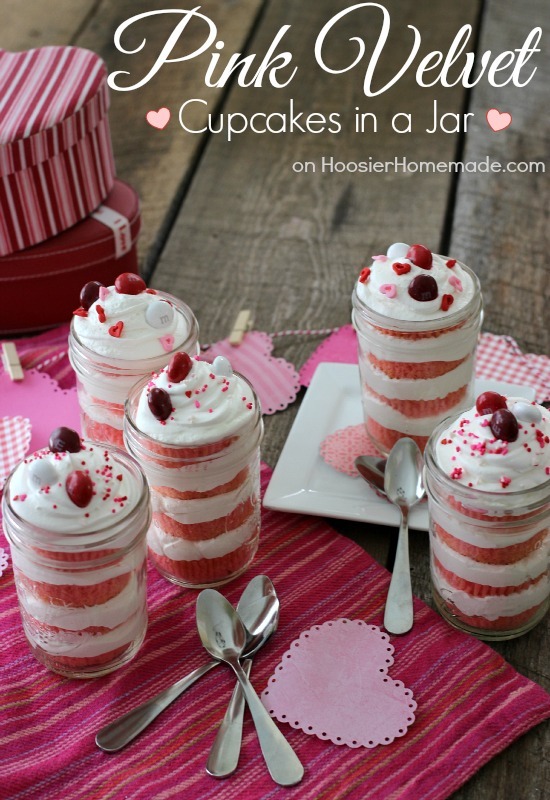 These Pink Velvet Cupcakes in a Jar make the perfect Valentine’s Day treat to serve after dinner or give as a gift. 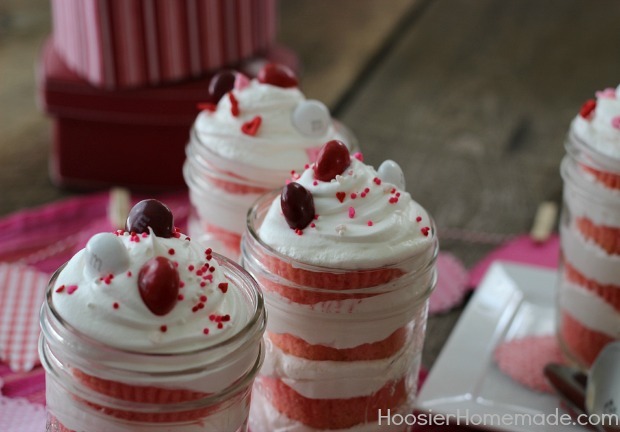 These sweet little Valentine’s Day Treats are simple to make. You know I like creating easy desserts that look impressive. I started with a Duncan Hines Signature Pink Velvet Cake Mix, added Cool Whip Whipped Topping in between the layers and topped them with sprinkles and Red Velvet M&M’s. 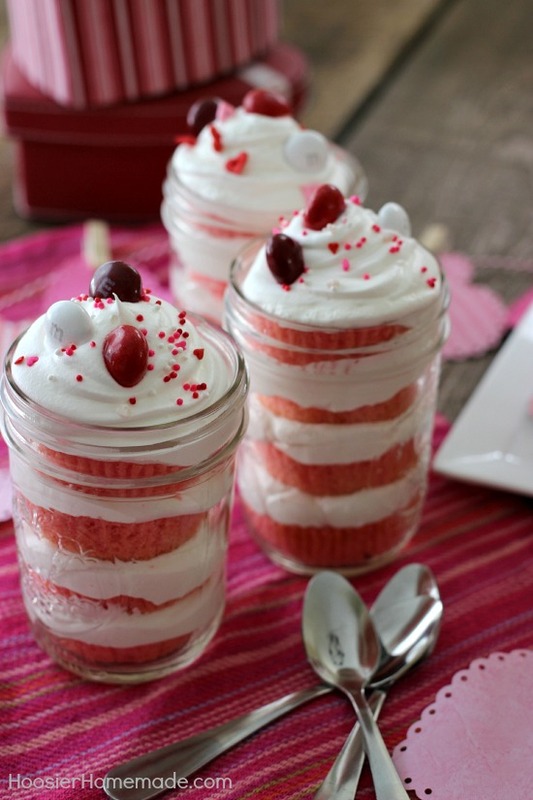 There are several different options for serving cupcakes in jar. These jars are 1/2 pint mason jars. 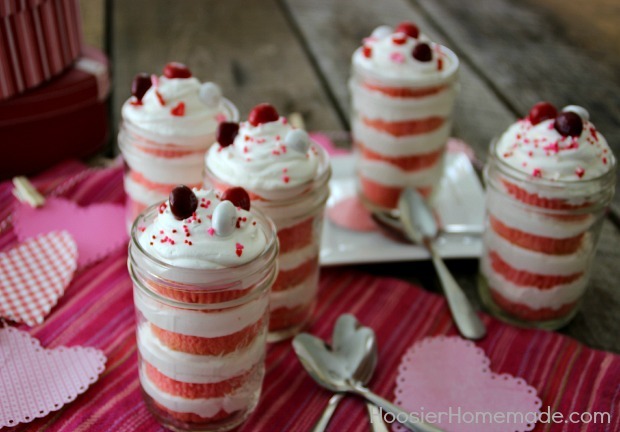 You will need 2 cupcakes for each jar and it took a full 8 oz container of Cool Whip to fill 5 jars. I love the way they look and are definitely perfect to add a lid and give as a gift, but perhaps a little too much if you are serving them after dinner. You can also bake the cupcake right in the jars, but since I wanted several layers, I choose to bake them as I normally do, then cut them in half. To add the Cool Whip to the jar it’s easiest to add it to a Decorator Bag, then you can pipe it easily into the jar. Adding red M&M’s candies and sprinkles to the top is optional, but of course fun! You will have leftover cupcakes. If you need more than 5 jars filled, you will need to buy more Cool Whip. 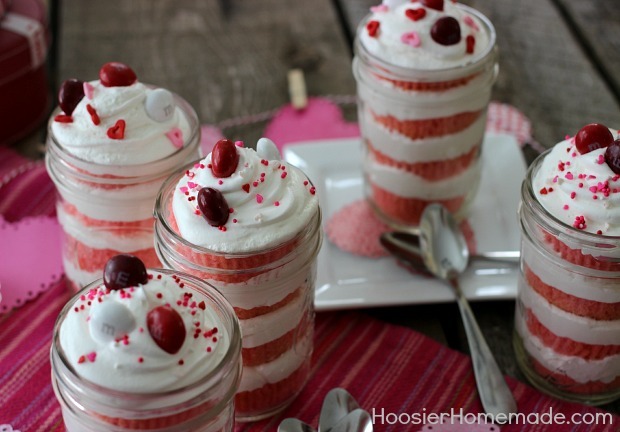 I love this idea for Valentine’s day!! !